Some people do. If you’ve ever experienced an itchy red rash after wearing earrings or other jewelry, it could be an allergic reaction to nickel. Nickel is the most common metal for jewelry makers to use. However, jewelry is not the only place you can contact nickel. Bra hooks, watch bands, zippers, coins and eyeglass frames are just a few of the ways we come in contact with nickel every day. Allergies to nickel and other jewelry metals are more common than you think. Around 20% of the population suffers from nickel allergies and especially women and children. Keep reading to see what to do if you have an allergy and the best ways to prevent allergies to nickel by switching to hypoallergenic jewelry like titanium stud earrings. Nickel allergies, like any other allergy, is your body’s natural response to a foreign body like a bacteria or virus. It is your immune system protecting itself from a harmful substance. It is unclear why some people react to certain metals, and others don’t. Sometimes the body can respond immediately, such as a new piercing. Other times it can be a build up over years of exposure. However, once you develop symptoms, you will always have an allergic reaction to nickel or whatever the substance is. You’ll need to avoid contacting nickel in all forms, not just jewelry. Fortunately, we have the solution below. The medical term for an allergic reaction to nickel is contact dermatitis. Symptoms appear within hours of contact. Typically, it will only affect the site of contacts such as the earlobes for earrings or the neck if you wear a necklace with nickel. Should you experience any of these allergy symptoms after wearing a new piece of jewelry or earrings, remove them immediately. As with any quickly changing or spreading condition, seek medical advice. Your doctor may prescribe oral antihistamines and oral corticosteroids to reduce inflammation. If you have mild symptoms, remove the jewelry at once and apply a steroid cream or ointment. Once you have an allergy, you have it for life. The best prevention is to wear only hypoallergenic jewelry. Your best choices include those made from medical grade plastic and titanium earrings studs. Titanium earrings are beautiful, affordable and allergy free. Medical grade plastic is another popular alternative especially for babies and new piercings in adults. It won’t promote the growth of bacteria like cheap plastics, and it’s durable. Do You Love Earrings But Afraid of Allergies? A necklace or bracelet always looks better with matching earrings. Be sure to buy only hypoallergenic, nickel free jewelry to avoid the complications of an allergic reaction to nickel. 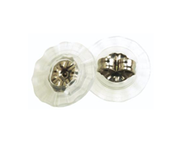 One of the best sources for beautiful titanium earrings and medical grade plastic earrings is Blomdahl USA. We offer exclusive titanium earrings in natural, gold, silver and black. You can choose from 3mm up to 20 mm. We offer three styles including titanium stud earrings, pendant and sleeper earrings. The crystals are genuine Swarovski crystals for brilliant color and sparkle. All our hypoallergenic jewelry is untouched by human hands during manufacturing. The first person to touch your nickel-free jewelry is you. More importantly, it’s beautifully designed to match any outfit or occasion.